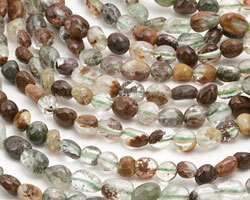 Lodolite (Lodalite, Lodelite) is a type of included quartz that is mined exclusively in Minas Gerais, a state in southeastern Brazil. Also known as "garden quartz" or "landscape quartz" due to the floating images captured within the clear crystal, this lodolite contains inclusions of many possible colors and shapes in patterns suggestive of gardens, landscapes, or underwater scenes. 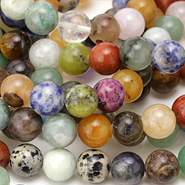 The mineral inclusions vary from bead to bead and each piece is unique; the patterns in the larger shapes can be very dramatic. 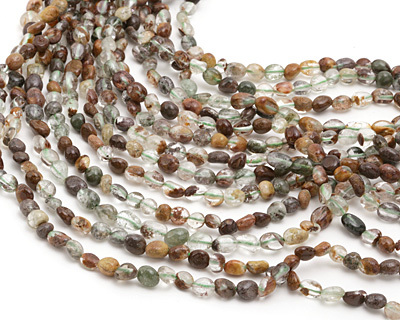 The inclusions in these Lodolite beads are in the soft hues found a beautiful rose garden: moss green, rose, burgundy, cream, and amber.